Move over parker house rolls, there is a new dinner roll that I am serving on my Thanksgiving table - enter the buttermilk fantails. 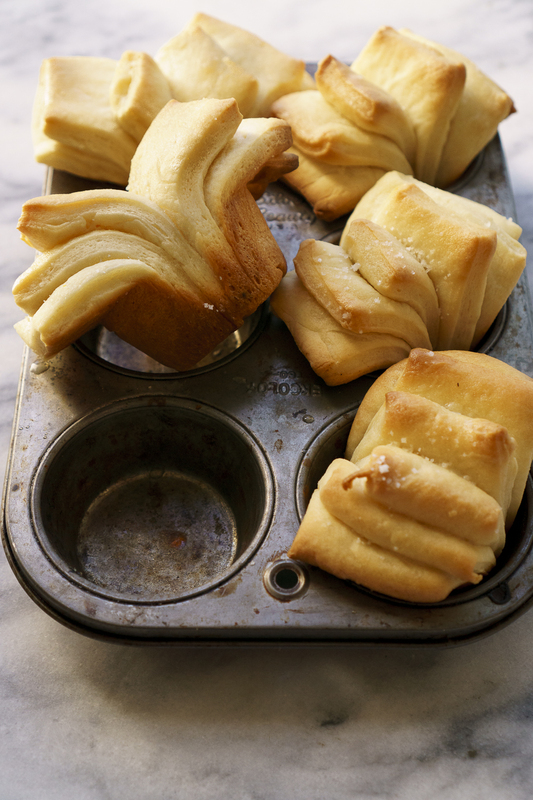 Similar to the traditional parker house roll, these are an enriched dough with eggs and butter, then baked in a really beautiful fan shape, creating an elegant and tasty dinner roll for your table. Melt the butter in a small bowl. Set aside but keep warm. In a small bowl, combine the yeast, water, and sugar. Let yeast mixture proof for about 5 minutes or until the mixture starts to bubble. In a large bowl (or bowl of stand mixer) combine the flour and salt. Add in the yeast mixture along with 8 tablespoons of butter, and the buttermilk. Knead using the dough hook or your hands until the dough is smooth but tacky. Place dough in a large bowl that has been sprayed with nonstick spray. Let dough rise until doubled, about 1 - 1 1/2 hours. On a clean lightly floured surface, cut the dough in half. Roll one half of the dough out into a 12” square. Brush with dough with 1 Tbs. melted butter. Using a knife or pizza cutter, cut the dough into 6 - 2” strips. Stack strips on top of each other then turn and cut into 5 equal pieces. Place each piece in a muffin cutout in the muffin tin with the cutout sides facing up. Repeat process with remaining dough halve. Let dough rise until doubled. Bake until golden brown, about 20 to 25 minutes. Brush with remaining 2 Tbs. butter and sprinkle with flaky sea salt. Serve warm.